Experts say glass buildings kill millions of birds every year. Scientists at Powdermill Avian Research Center are studying ways to help prevent this. 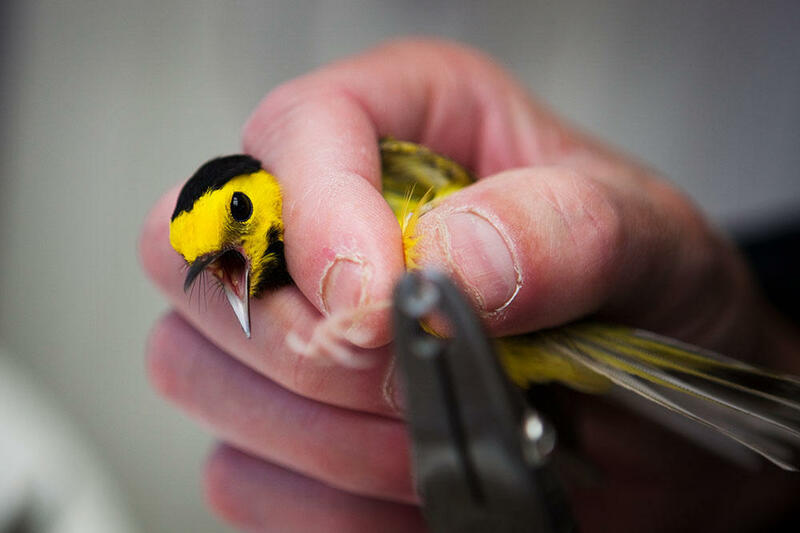 Here, a volunteer tags a black hooded warbler in Rector, Pa., in May. 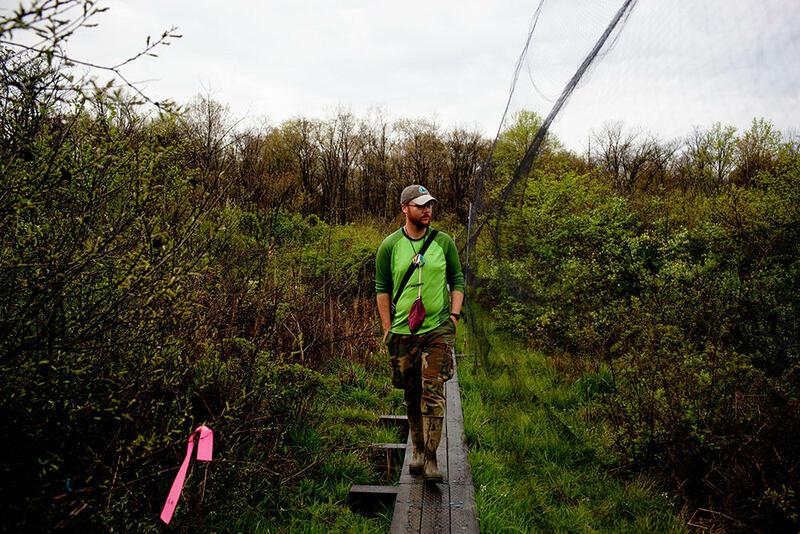 Luke DeGroote, the banding program coordinator, looks for birds trapped in fine-meshed mist nets. Nearly 70 nets cover a 24.7-acre area at Powdermill; they need to be checked every 30 to 40 minutes. 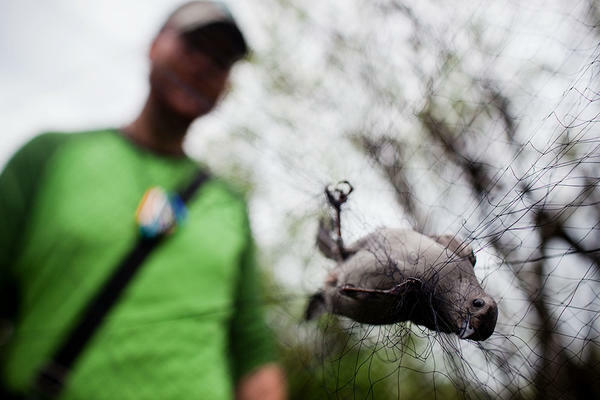 DeGroote collects a gray catbird caught in one of the nets. The 39-foot-by-8-foot nets are designed to safely capture birds. Menzel prepares an experiment to test how birds react to various types of glass. The birds are placed at one end of the tunnel, then fly toward the glass panes at the other end. A fine mesh net catches the birds before they can hit the glass. Menzel looks into the tunnel to see if the bird flew toward the regular glass or the glass with the pattern. 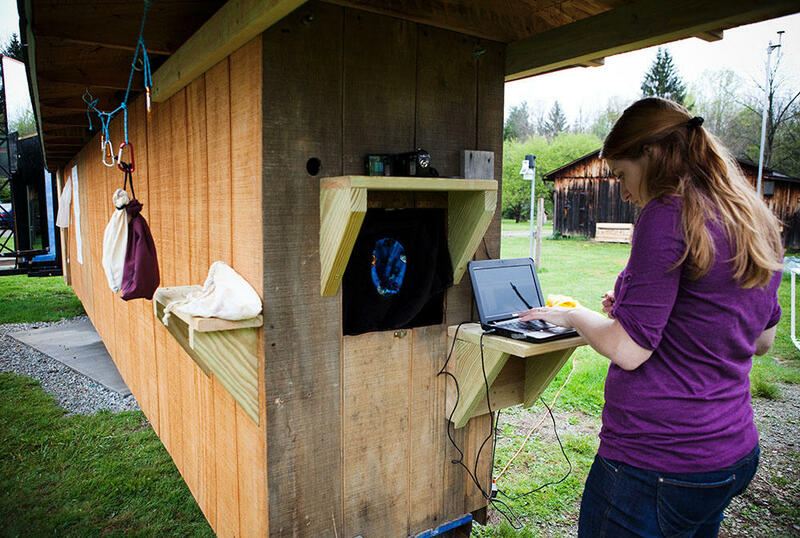 This experiment will help to determine which glass is better to use in bird-friendly architecture. Christine Sheppard (left), an ornithologist with the American Bird Conservancy, and her assistant, Cara Menzel, insert two panes of glass into a test tunnel. One pane is a regular piece of glass; the other has a pattern of lines painted on the inside that reflects ultraviolet light. The birds can see the pattern, but it is barely detectable by the human eye. 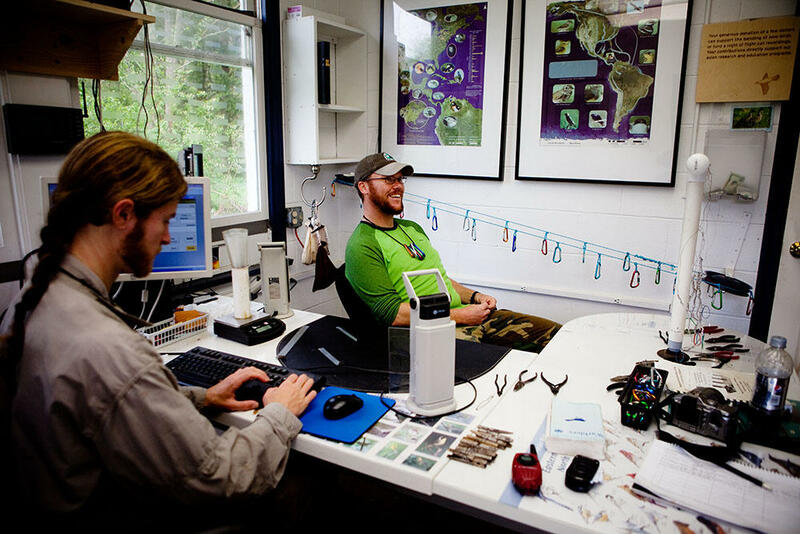 DeGroote and Blaine Cernes, a banding assistant, enter the data they've collected into a database that will help monitor how well the avian populations are doing in the wild. 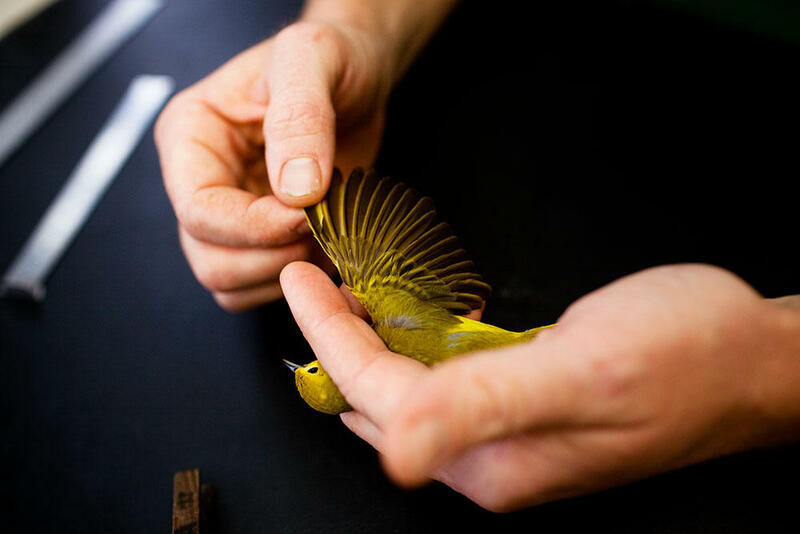 DeGroote examines the wing of a yellow warbler. Experts say glass buildings kill millions of birds every year; scientists at Powdermill Avian Research Center are studying ways to help prevent this. 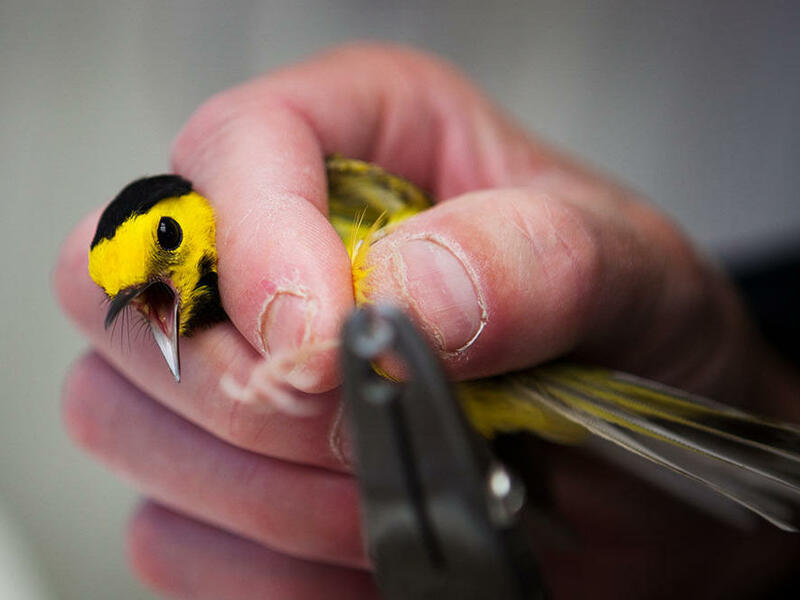 Here, a volunteer tags a hooded warbler in Rector, Penn., in May. 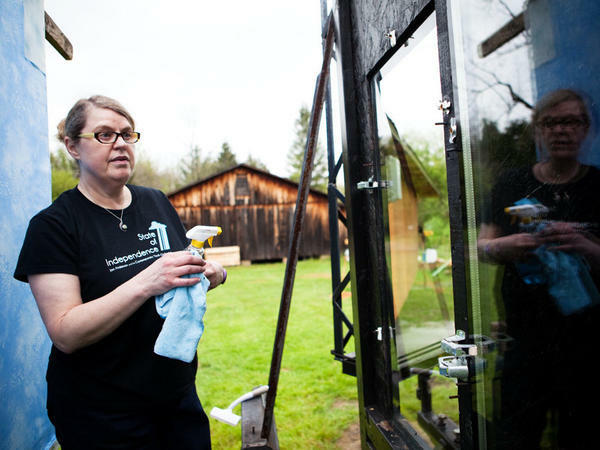 Christine Sheppard, an ornithologist with the American Bird Conservancy, cleans windows before conducting an experiment that will help determine which pane of glass is more bird friendly. Modern architecture loves glass. Glass makes interiors brighter and adds sparkle to cityscapes. But glass also kills millions of birds every year when they collide with windows. Biologists say as more glass buildings go up, more birds are dying. So a group of biologists and architects is trying to do something about that. 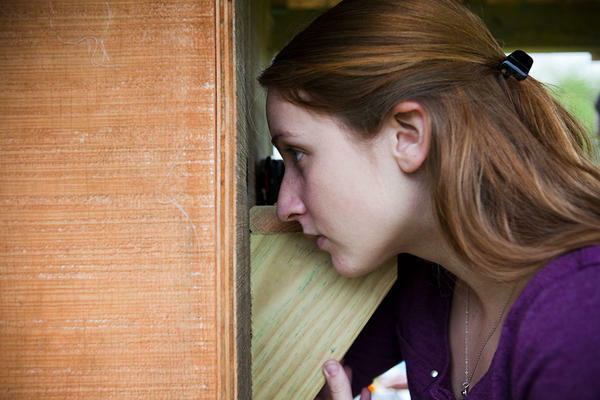 You'll find some of them at the Powdermill Avian Research Center in western Pennsylvania. They're catching birds. Biologist Luke DeGroote patrols a mist net that runs for hundreds of yards through a dense, wet forest. It's mid-morning, the sun is just above the tree line, and it's easy to walk right into it. "It's a very fine mesh," he says, "and that's why the birds run into it. They essentially will fly towards the net and fall into these pockets." The pockets at the bottom of the net catch the birds and entangle them. Biologists normally retrieve the birds — unharmed — and mark them with metal bands to follow their migrations. But today the catch is for Christine Sheppard, an ornithologist with the American Bird Conservancy. Her mission is to stop birds from flying into glass. A lot of them do, and die. "Our best estimate is 100 million to a billion" birds in North America die this way every year, she says. It's an incredible number, and she acknowledges it's an estimate. But it's based on reasonable assumptions. "Almost anybody you talk to has seen a bird hit a building or heard a bird hit," Sheppard says. She's wearing the muddy boots of a field biologist, and she speaks with the passion that many birders hold for the creatures they study. "The fact that so many people are seeing this means it's happening all the time." Sheppard says birds don't see the way we do. "Reflection is definitely a problem," she explains. Most birds don't have good depth perception beyond their beaks — they have to get relatively close to an object to see much detail or distinguish it from background. Reflections in glass can make it seem as if there's no building there — just more sky, clouds and trees. Even when there's no reflection, glass confuses birds. "The other thing that happens," Sheppard says, "is that birds will try to fly through glass to something that's on the other side. This can be a planted atrium. It can be a potted plant." So Sheppard has set up an experiment at Powdermill. She's putting birds in a tunnel that sits in a grassy part of the reserve. It looks like a house trailer. Two panes of glass enclose one end — there's regular plate glass on one side; next to it is a pane of specially coated glass. Sheppard is testing various coatings on and in glass that are visible to birds, but not to people. A fine mesh net just in front of the glass keeps the birds from actually hitting it. Luke DeGroote comes to the tunnel with the morning's catch: catbirds. They screech, though not like any other bird you've heard. "They get their name from that catlike sound that they make," says DeGroote. The birds are in cloth bags; DeGroote wears several tied on a string around his neck. Sheppard's assistant, Cara Menzel, takes one and gives it a number — this one is 49931. Then she gently puts it in the tunnel. A camera mounted in the trailer wall focuses inside and films which glass window it flies toward. "Direct left," she says. The bird flew directly to the left, toward the regular glass. The glass on the right has a pattern of lines painted on the inside, and the idea is to see if the bird will avoid it. The pattern is made of a material that reflects ultraviolet light. Birds see well in the ultraviolet range. Presumably, they see the pattern as something solid; the human eye can barely make it out. But Menzel notes that when the sun sets, it's a whole new problem — "especially during these big migrations," she explains, "where the birds are coming through in larger numbers, and a lot of them fly over at night." Biologists believe birds are attracted to the lights inside buildings at night. Sheppard has studied birds all her life. She says the real difficulty is trying to think like one — to figure out why they do what they do. There's been some research in Europe on bird-friendly glass, but not much here. "Not enough people know about it, and it's really important," she says. "Many people believe that birds have an intrinsic right not be killed. Birds are seed dispersers; they eat tons of bugs. So every bird that's killed on a building is an ecological service that we lose." Several cities in the U.S. and Canada either have or are considering new building codes that require bird-friendly materials. And there are some quick fixes for windows — decals or sheets of patterned plastic that attach to glass. But ideally, biologists and architects want solutions that people can't see and that will be standard products in buildings — and that won't cost an arm and a leg. In part two, we visit an architectural firm that's leading the search for bird-friendly buildings. And now let's move from welfare reform to architectural reform. Modern architecture involves a lot of glass. But glass kills millions of birds every year, when they collide with windows. Biologists say as more glass buildings go up, more birds are dying. NPR's Christopher Joyce has the first of two reports on what a group of scientists and architects are doing about that, and he begins at a bird preserve in Pennsylvania. CHRISTOPHER JOYCE, BYLINE: Today at the Powdermill Avian Research Center in western Pennsylvania, scientists are catching birds. Luke DeGroote is patrolling a mist net that runs for hundreds of yards through a dense, wet forest. LUKE DEGROOTE: It's a very fine mesh, and that's why the birds run into it. And they, essentially, will fly towards the net and fall into these pockets. JOYCE: Biologists normally retrieve the birds, and then mark them with metal bands to follow their migrations. Today, though, the catch is for Christine Sheppard. Sheppard is an ornithologist with the American Bird Conservancy. Her mission is to stop birds from flying into glass. A lot of them do, and they die. CHRISTINE SHEPPARD: Our best estimate is 100 million to a billion. JOYCE: A billion dead birds a year, in North America. That's just a guesstimate. SHEPPARD: Almost anybody you talk to has seen a bird hit a building, or has heard a bird hit. The fact that so many people are seeing this, means it's happening all the time. JOYCE: Sheppard says birds don't see the way we do. Most don't have good depth perception beyond their beaks. They have to get relatively close to an object to see much detail, or distinguish it from background. What they do see in glass, is sky or trees. SHEPPARD: Reflection is definitely a problem. JOYCE: Reflections that make it seem as if there's no building there; just more sky and clouds and trees. Even when there's no reflection, glass confuses birds. SHEPPARD: The other thing that happens is that birds will try to fly through glass to something on the other side. And this can be a planted atrium; it could be a potted plant. JOYCE: So Sheppard has set up an experiment at Powdermill. She's putting birds in a tunnel that sits in a grassy part of the reserve. It looks like a house trailer. Two panes of glass enclose one end. There's regular plate glass on one side; next to it is a pane of specially coated glass. Sheppard is testing various coatings on - and in - glass that make them look visible to birds, but not to people. A fine-mesh net just in front of the glass, keeps the birds from actually hitting it. JOYCE: Luke DeGroote comes to the tunnel with the morning's catch - catbirds. DEGROOTE: And they get their name from that cat-like sound that they make. JOYCE: The birds are in cloth bags. DeGroote wears several, tied on a string around his neck. Sheppard's assistant, Cara Menzel, takes one and gives it a number. JOYCE: Then she gently puts it in the tunnel. She films which glass window it flies toward. JOYCE: The bird flies directly to the left - toward the regular glass. The glass on the right has a pattern of lines painted on the inside. It's a material that reflects ultraviolet light. Birds see well in the ultraviolet range. Presumably, they see the pattern as something solid. The human eye can barely make it out. But Menzel notes that when the sun sets, it's a whole new problem. MENZEL: Especially during these big migrations, where birds are coming through in larger numbers. And a lot of them fly over at night. So the lighting with the glass, at night, can play a big factor in it. JOYCE: Biologists believe birds are attracted to the lights inside buildings. Sheppard has studied birds all her life. She says the real difficulty is trying to think like one; to figure out why they do what they do. There's been some research in Europe, but not much here. SHEPPARD: Not enough people know about it, and it's really important. JOYCE: Why is it important? SHEPPARD: Many people believe that - you know, birds have an intrinsic right not be killed. Birds are seed dispersers; they eat tons of bugs. So every bird that's killed on a building, is an ecological service that we lose. 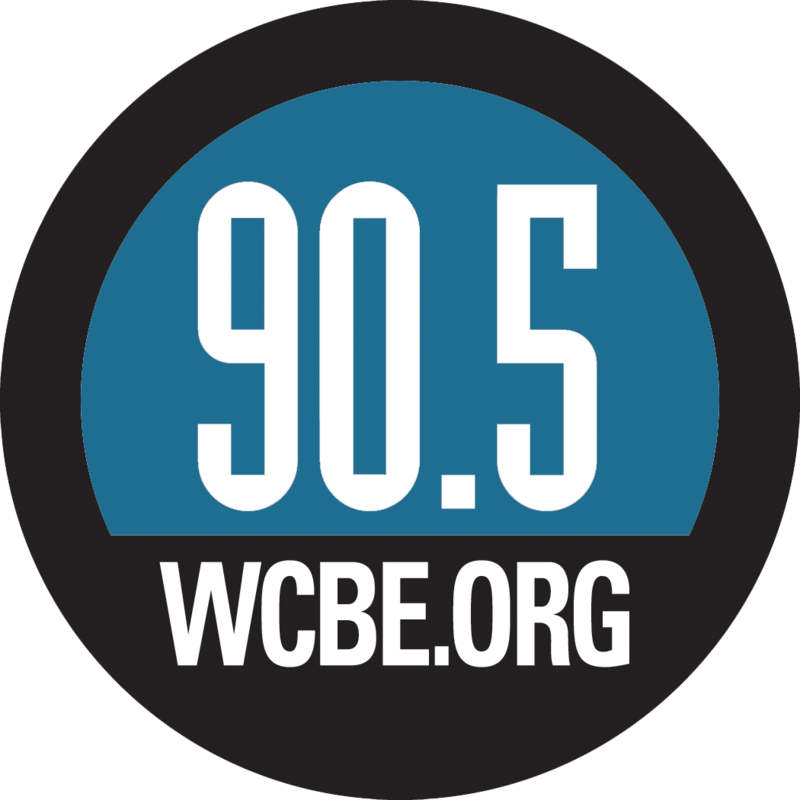 JOYCE: Several cities in the U.S. and Canada either have, or are considering, new building codes that require bird-friendly materials. And there are some quick fixes for windows - decals, or sheets of patterned plastic that attach to glass. But ideally, biologists and architects want solutions that people can't see, that will be standard products in buildings, and that won't cost an arm and a leg. INSKEEP: Tomorrow, we visit an architectural firm leading the search for bird-friendly buildings. Transcript provided by NPR, Copyright NPR.